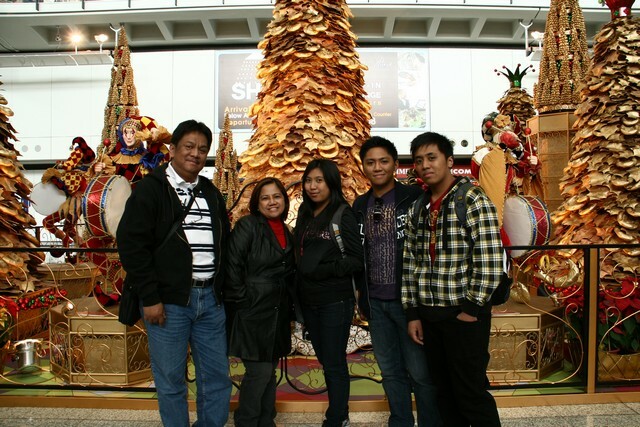 My mom, bro, nieces and nephews flew to Hongkong via Cebu Pacific last Dec. 21 at 8 am. 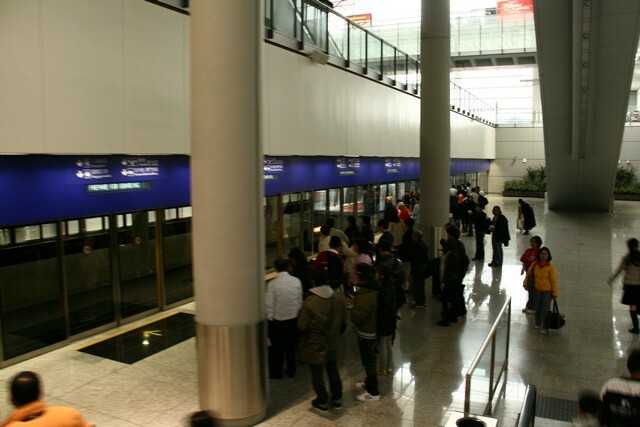 It was at NAIA 3 so it was comfortable for us since it was big and more modern compared to NAIA terminal 1. We arrived early for our departure but we're greeted with a long line outside the airport. 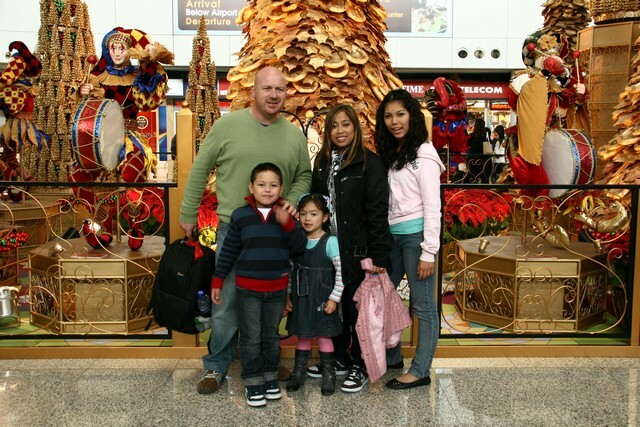 My sister JOY and her family who arrived a day early in Hongkong greeted us at the airport. 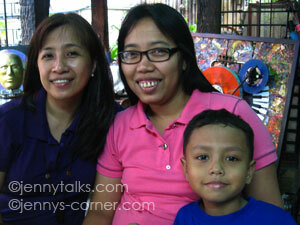 My older sis Beng and her family from Riyadh also came to fetch us at the airport. Hey all.. I'm back and I hope you all had a great Christmas. My family and I went to Hongkong for a 3nights- 4day vacation from Dec. 21-24. We all had a blast and I have lots of stories and photos to share but I will be sharing them soon once I resized all of the photos. 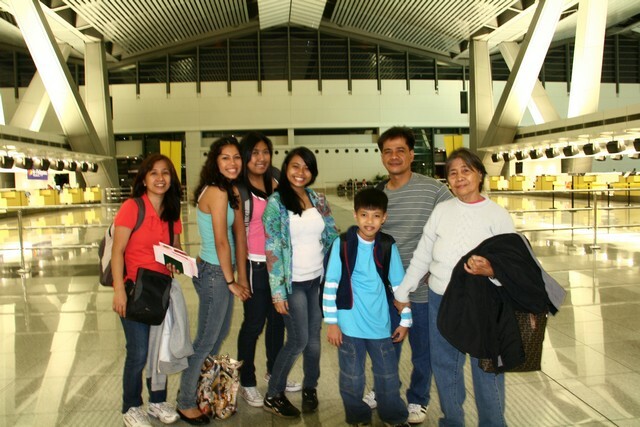 My sister JOY and her family from Sydney is also here in Pinas for their 3-week holiday vacation. We met in Hongkong together with my other sis and her family from Riyadh. As soon as we arrived back home we went to nearby SM mall to buy some gifts fro Christmas and it's hard because we are rushing. We've been out most of the times to go malling, shopping and dine out and it's pretty hard for me to get back to work because of that. I still have to check on the topic of diagnosing ADHD online but since I am still lazy I have a hard time concentrating on some of my online works. I'm hoping that I'll have enough time again today so that I can re-size some of our Hongkong pictures to share to all of you. For sure by the time you'll read my family and I are in Hongkong for a short 4days-3nights vacation. 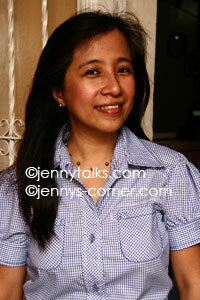 Hello all, I got so little time to blog these days because of the many occasions that are happening. I'm also busy finishing my Christmas shopping and just like today I went out again to re-book my niece and nephew's HK trip then later on did some shopping. I have tons of photos to share but I got no time yet to download it form my camera but hope I can do that before the year ends hehe. 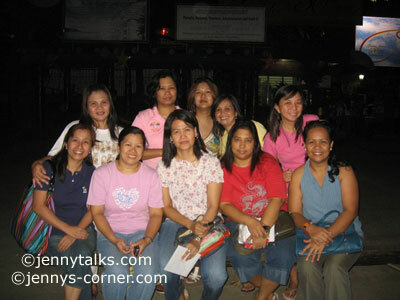 I'm still giddy with our upcoming highschool reunion on Saturday and our Hongkong trip on Monday wahoooo. Hello all, I guess most of you are all busy with your holiday shopping and have attended some Christmas parties as well. My days are becoming busier because there are many events and occasions that has happened in the last few days and more events will happen in the coming days. I’m also noticing that I’m slowly becoming sluggish at work (which should not happen in the 1st place) and just wanted to go on a holiday hehe. Can’t blame me cuz the holiday season is creeping in me. I still have to download photos from my camera’s memory card but there are times it’s slipping in my mind. Forgetful or just plain lazy? Looks like I need to keep my brain alert perhaps by playing free puzzles online. Nah…I guess my brain is just focusing on the forthcoming like highschool reunion on the 19th and our Hongkong trip on the 21st. Ahhh.. I can't wait! I got excited when I looked up at the sky and saw the clouds like this so I hurriedly went on top of our garage with my niece. We took some shots of this awesome cloud formation and colors at the roof minding that we need to be careful bec. we might fall haha. Minutes after that, it started to rain so our photoshoot was packed up. Have a great weekend to all! I was at the mall the other day and I noticed that people mostly women are in the home department maybe trying to buy some house fixture to improve some areas in their house. How I wish I could renovate our house but I have no budget for that. I know you have found yourselves glued to home depot stores admiring all the nice home and bathroom fixture that they have on their showrooms. Bathroom fixtures are improving through the years bringing new, innovative and useful fixture for every household. Towel Warmers are for one, they are seemingly practical to have in every bathroom. Owning an electric towel warmer in your bathroom is a unique way to keep your towels warm and dry. I reckon not only towels are perfect for that but there are times when you can just hand your bathing suit and other delicates. Just in case you’ll be needing towel warmers for your bathroom, a tour at QualityBath.com online can be of help because you can find towel warmers of different brands and styles. They have top brands like Rohl, Mr. Steam, Jeeves and even Myson Towel Warmers and more. However, there are many things to consider if you want to install one in your bathroom. Do you need to have an electric or hydronic type of towel warmers? Do you want it plug in or hardwired or with timer or not? What ever specifications or concerns that you need to find an answer just read their buyer’s guide and resources. Here’s one of the top selling Jeeves towel warmer, also perfect as a holiday gift. I've been wanting to clean my room for a while now and finally I got some time this morning. It is seldom that I do general and thorough cleaning so it took me a while to finish it. Dusting and mopping and I also threw some old stuff in the trash. I still need to open my drawer and for sure there are some papers or bills not are needed anymore. I will also select some of my clothes and give it away but I've already done it last month where I gave jeans and blouse to my niece and SIL (yeah we almost have the same size). I wanted to clean the whole house but it is impossible for me to finish all of them today so I stopped and I will continue it by tomorrow or Saturday. It's a tiring morning for me and I can say that cleaning is one of the hardest jobs in the world, hehe. It's always our routine to have a general cleaning each year before the year ends to give room for new items that will be coming in. My sis and her family from Sydney will be coming home this Christmas so we also need to make our place more neat and presentable. I guess most of you are also cleaning , purging or throwing old stuff as well. It was 2 weekends ago when we bought one of the Capiz Christmas lanterns being sold at the streets near our house. 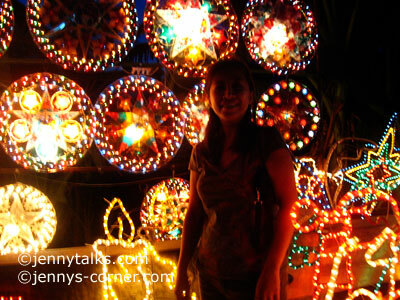 The lanterns are made out of capiz shells and added with bright and colorful lights that are twinkling in sequence. There are actually lots of different sizes to choose from and aside from lanterns shaped Santa Claus, candle, coconut tree with lights are also sold. 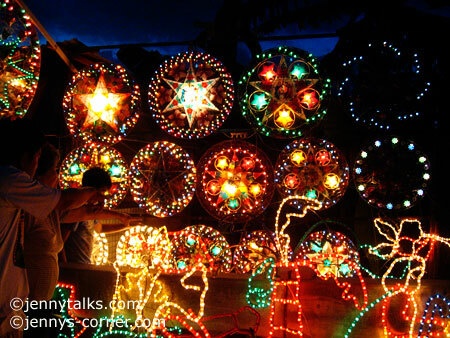 Capiz lantern prices ranges from 1,000- 5,000. We bought ours for Php1,200 and is now hanging at our garage and we lit it every night. Christmas here in the Philippines is not complete without lanterns (can be made out of paper, plastic, capiz, wires etc), this year we wanted to have a different lantern at home so we bought a capiz one eventhough it's a bit pricey. 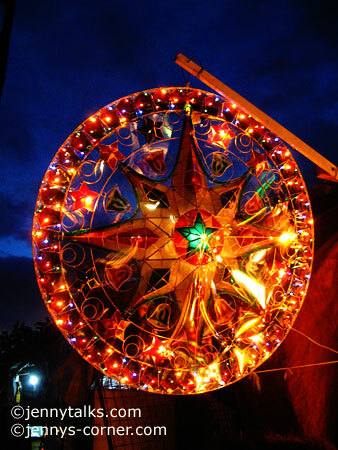 This big Capiz Christmas lantern is sold for P5,500 but of course you can still haggle for the price. What about you do you have any lanterns hanging on your homes already? My cousin was here yesterday and he handed me an invitation and he called me "ninang". He is actually asking me to be the godmother of her twin daughters and of course it's an honor to be asked. 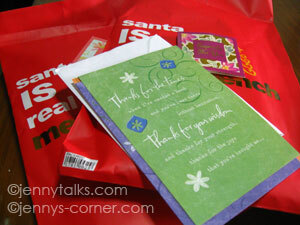 The baptismal will be on Saturday already so I hurriedly dropped by the mall to buy a gift for the twins. I'm actually having second thoughts of what to give but decided on something that the twins will use and I think it's cute. I also strolled at the mall, fitting shoes but could not find what looks good on my feet. 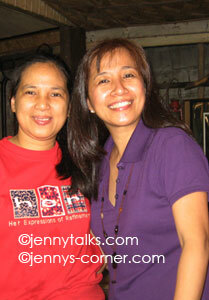 I also tried on some red blouse because our reunion requires us to be in red but it doesn't fit as well. I could have canvassed for glass tiles as well but I was pressed for time because I need to go back at my shop. Christmas tree up, check. Christmas lights, check. Christmas cards, check. Christmas shopping, check. Wow, I dunno about you but this Christmas holiday mood is getting into me already. The days are also getting colder each day that sometimes I want to curl up in my bed and stay more. 2. Dec. 12th afternoon I need to attend the meeting with my former hs classmates. 3. Dec. 14th, we’re going to fetch Micah at the airport from Sydney because she is coming home ahead of her family for their holiday vacation. Our days will be filled with things to do and we also wish that one day we can also go to Singapore or Thailand and who knows take on myrtle beach vacations. I guess your family has lots of fun things to do this Holiday as well. I hope you are as excited as I am for Christmas this year. Ok this is a very overdue post already and sorry for that. Blame it on my laziness sometimes on uploading photos and my memory gap for forgetting to post it right away. Anyway, my dear online friend CHERRY ROSE had a birthday contest last September and I was the top winner. My prize is not one of those modern sofas (but it would be nice if it is hehe) but I got this nice Guess necklace that I already have worn. It arrived from the mail last November and it is only now that I got to post it hehe. It's Amazing Race time once again and here's the Results of The Amazing Race 15 Final Results and the Grand Winner of the Amazing Race Season 15 is MEGHAN AND CHEYNE (my fave team). They won $1 million. The game was sooooo exciting, I can't wait for the Season 16!! ~Then they went to THE MIRAGE- where they join the cast of LOVE cirque de soleil. One member must be in a bungee cord and need to bounce to get the flower. ~ They need to find out what is the most famous casino in Monaco where they need to go there. The answer is MONTERCARLO CASINO where they played CHIP COUNTING. Count $1 million worth of chips to get the next clue. ~They need to got to MGM and look for MR. LAS VEGAS, which is WAYNE NEWTON and he'll tell the finish line which is his home. 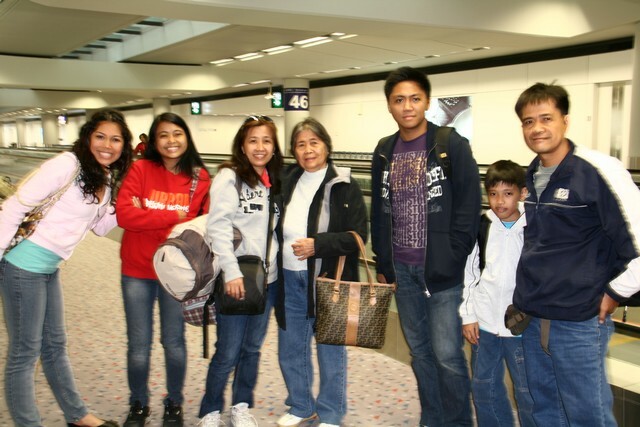 Our Family HK Vacation soon! I can already count on my fingers the days that my family will be away for a short vacation in Hongkong. It’ll be for 4days and 3 nights that we will be away this December everyone is actually getting excited over it. The kids are imagining how Disneyland will look like while we adults are thinking about our shopping!!!! I know it will be a blast and we are praying for our good health so our trip will be great. Ahhh I can’t wait. I know many of us will have a family vacation this holidays and no matter where you go we should take the most out of it and enjoy. Just take the moment to bond with your family and friends since it’s a holiday. Just in case you don’t have plans of going out this year bec. we all know that it’s fully book already, you can perhaps browse www.karismahotels.com for your future family vacation. With the wide array of vacation packages like seaside suites or hidden beach resort that they have there’s no doubt that you’ll find a package that will suit tour budget and travel needs. 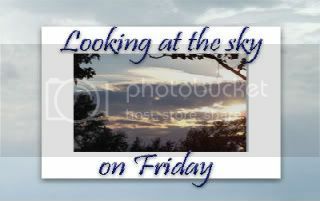 Looking at the Sky on Friday: Gloomy ?? It's only my second time to join this photo meme and I never realized that capturing the sky can be fun and can relay "message". Just like this photo that I took while we are driving home one mid afternoon. The sun is still up yet the clouds are getting dark as if they are signaling a rain about to fall. Our weather here is getting cool each day esp. in the early mornings with some rain showers every now and then in the afternoon. Have a great day everyone! My Gift from my Twitter/Bebots "Mommy"
Lookie, what arrived last Sunday! It was the gift from my Twitter/Bebots "Mommy", wahoooo!!! We had an online exchange gifts back in September and here's what she got for me, a Clinique Happy perfume which is on my Christmas wish list. Thank you mommy!! but there's one problem. I still don't know her name yet because the LBC package has no return address or her name on it and that makes me more excited and puzzled. If you are my mommy, please introduce yourself to me so I can personally thank you. 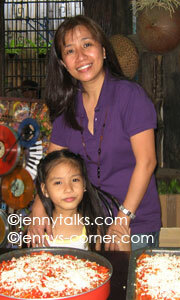 I know MAI will be saying she is my mommy, LOL. This Clinique Happy perfume will be added to my perfume collection. Ahhh I love the scent! The gifts are coming in MORE please hehe! When it comes to purchasing a new car or any vehicle for that matter we may sometimes caught in a tangle. The decision on what is best for our lifestyle, budget, and maintenance capability are just some of the factors we might consider before even going to a car dealer whether online or offline. The color, make or type can also add to the confusing especially if you are not the only one deciding on what to acquire. I reckon you need to sit down and think about what you want; an SUV, mini-van, truck or a car then the colors and manufacturer will come in next. I know it’s pretty hard to choose because there are wide array to choose from that’s why it’s always best to look around first, maybe you can test drive first, then make a decision. There are many cars that you can opt to choose, aside from Toyota, lexus, there’s acura make. The 2010 Acura RDX maybe for you if you want a sportier and stylish on its own. You can always find good reviews of Acura online that can aid you in choosing what model that can suit your driving needs. If only we can afford to have one of the latest car models then I will grab the chance but since we have bought a second hand van few months ago then getting a brand new one seems not a priority. Having small kids in the house can be a little worrisome because they are always prone to bruise and bumps and other minor accidents if they are not properly taken care of. We may thought that they are behaving in one corner and little did we know they are already messing some of the things that even if we put it in a safe corner they still can get it. My nieces and nephews when they are still small have experienced falling off from a chair, knocking their heads etc. on the walls so we always have our first aid kits handy. My niece who was around 3 yrs old got accidentally burned her fingers with hot water and oh dear she was really hysterical. We can’t always prevent freak accidents from happening no matter how careful we are. Not only at the house should we need to have first aid kit because we also must bring it when we travel for unexpected injuries. It’s like being ready at all times. 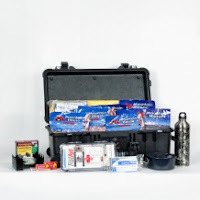 Should you be needing First Aid Supplies, AB First Aid Store can be helpful in keeping your supplies at home, clinic, ambulances, hospitals or more come in handy. 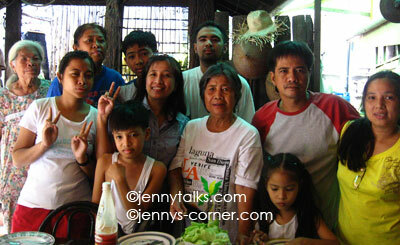 I remember the devastating Ondoy typhoon last September and if only every household have a 72hr. kit I guess it would have been better. What about you do you have first aid kit at home? It was last Saturday when our highschool batch had a meeting at our former Highschool campus. We are actually ironing some things for our forthcoming 25th Silver HS reunion this Dec. 19th and oh boy are excited already. I made our invitations and I'm currently making a layout for the tarpaulin that we'll be using at the venue. It's always nice to see them each meeting and discuss some things. 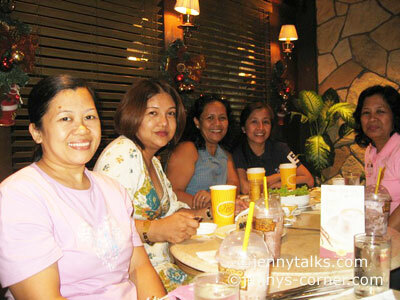 After the meeting we decided to eat some snack at Jollibee and later on a classmate of ours invited us for a coffee at FIGARO in Sta. Lucia. The night was fun-filled, more chicas and jokes are shared and on the 13th we'll have our last meeting. Later than night eventhough it's already 11 pm, I still went with 3 of my classmates to go to the wake of one of our classmates. It was 12 midnight that I arrived home safely. WOW, it's December already! The countdown is on! Now that the Internet has become a part of us almost every single day, it’s a great tool for us to use to research everything that we wanted to know. From simple e-mailing, research on projects, health and beauty tips, to online shopping, paying bills and more, there’s no doubt the net is the best source of information. Eventhough the economy is a bit tight and still sloppy; there are some people who can still manage to make a car purchase. I guess they are taking advantage of the car companies’ marking down some of their cars due to slumping of the car industry this year. It’s always best to read reviews about any car that you want to purchase so that you’ll have an idea on some of its features aside of course from actual inspection of the vehicle. You’ll find TheCarConnection.com helpful in finding good reviews of different car models and brands. or the ford escape hybrid, the full reviews from their editors will be of help to you in deciding which car is suitable to your needs and budget. Before purchasing a car whether brand new or used, it’s always best to ask someone, read reviews and then compare and make a wise decision. It's Amazing Race time once again and here's the Results of The Amazing Race 15 Episode 10 Leg 11: Brian and Ericka are NOT Eliminated. The games is getting so exciting. Last night at 9pm (Pinas time) and 8 am Boston time, all of us twitter friends gather together at Twitter to have our Thanksgiving Party!! It was hosted by GLO where she gave gifts and prize money for winners on raffle and contest. 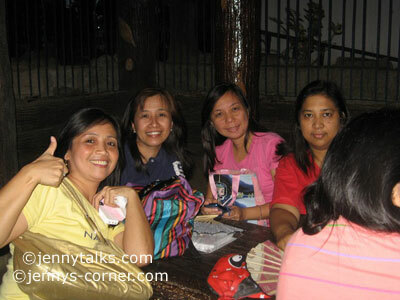 It was a riot as usual and very fun just like Glo's riot online birthday party last Aug. 18. First, we have to share what are we thankful about and soon after that the party started! Kathy won $20 at the 1st question, while others like Mai, Joy and other bebots (as we call each other) won cash, lotions and more. Litzie won a Coach necklace and New moon book at the raffle and she was so giddy about it. Too bad I didn't win again as usual but I had a blast. I was alone at out living room last night and in front of my pc and I was laughing alone hahaha. Our friendship online is the best, I never imagine I will meet such friends. I hope we'll have a Christmas/ New Year Twitter party! Can't wait for it. OK this is a super long overdue post but I'm sharing this anyway. You know sometimes, I'm just too lazy to download pics from my DSLR memory card. Anyway, here are some photos taken on my birthday this month (16th)and I have here my niece and my sister in law in the photos. Also came to celebrate with me is my bestfriend RACE since we are in second yr. in highschool with her son Josh. It was really a simple b-day celeb. Shopping season is here once again and SALE signs are already plastered almost everywhere be it online or off line stores. Shoppers are gearing up for their Christmas shopping and I guess most of you have started already just like me. For shoe lovers, I know you have all the reason to buy a new pair this season in fact I myself got a new one yesterday. I’m not a shoe aficionado but I love buying a pair or two once in a while. Shoes have become part of our wardrobe that experts say that if you have a good outfit (dress, jeans or whatever) but if your shoes doesn’t match it, then the whole look will be messed up. I agree with that because not all shoes can match all types of outfits. If you are itching to buy another shoes for yourself, here’s a Timberland Schuhe kaufen (Shoes buy) store online where they sell wide variety of shoes for your liking. To give you a short intro, Timberland Schuhe (shoes) was created by Nathan Swartz in 1973 and was known for waterproof shoes for construction workers. Now they have evolved and expanded and have more shoes to offer with over 50 different styles of shoes and brands that caters for men and women with the same durability and crafstmanship. You’ll find Timberland Stiefel (Boots), Sneakers, Sandals, Boat shoes, and more at the Boom Shoes. Check them out because they are having some sale, you might find a good deal. Happy Shopping! My dad and 2 brothers are smokers and we all hate seeing them puffing those cigarettes. I guess smoking have contributed to my dad's unhealthy lifestyle that resulted to his death. Soooo sad. My 2 brothers are unstoppable, my older bro stopped smoking for months because he was a bit ill because of it. The only sad thing is that he is into his habit once again when he already felt he is fine again. No one in the family can stop them from doing so. I myself hates the smell of the smoke and we all know that the second hand smoke is also not good. I'm not sure when they will stop, I reckon if I will introduce them to these Acid cigars, there are chances that they will still try them. Oh dear. I also not find appealing to see women smoking, much worst is when I saw a pregnant woman smoking despite her condition. Too bad for her and her baby, but that's her decision and who am I to stop her. Maybe if she'll become ill then who knows she will stop. After Manny Pacquaio here comes Efren Peñaflorida giving honors to our country!. Efren Peñaflorida was named the CNN Hero of the Year 2009 and as usual we are proud of him and my vote didn't put to waste. Watch his touching acceptance speech at Kodak Theatre in Hollywood and more details about him at CNN. Awwww who can resist Marty's Cracklin'?? The 1st time I tasted this, I can't stop munching' it. I brought some when we went at the cemetery last Nov. and oh boy my nieces and nephews can't get enough of it, the 3 packs are not enough. They even paired it with Coke while I settled with water. Is Marty's Cracklin' really guilt-free eventhough it's not real pork chicaron? Does munching eat will spare me and those that love it from having Stimerex ES in the future? One night time, while blogging I can't stop eating it but still feel guilty about it because I know it contains salt and other preservatives. Salt can make us bloat as far as I know but maybe if we don't eat this everyday and every now and then, I guess it's just OK to give in to some junk foods once in a while. Each 90 g pack costs about Php15.00 and just yesterday my mom wanted to buy some but it's not available at the grocery. The saleslady said it's always sold out. It's Amazing Race time once again and I'm already excited because finals is nearing here's the Results of The Amazing Race 15 Episode 9 Leg 10: Brian and Ericka are NOT Eliminated. Wow the race is really ON!! (This is my 1st time to join Looking at the Sky) Wow I never thought that these photos will turn out good because I took this using only my point and shoot camera inside our van on our way home lastSunday afternoon. I thought it will come out blurred because I was inside a moving vehicle and my bro is driving fast. This is actually at a rice field but it was destroyed by typhoon Ondoy last Sept. that's why there's still water there. Anyway, I love the formation of the clouds. I've already asked Reign what she wants for Christmas and time and again she always told me that she wants Barbie Mariposa. I'm not sure if Santa will give her that this year as she has too many Barbie dolls already. Oh well, girls will always want that no matter how many Barbie they already had. There's even one instance when Reign pulled me at the Barbie section and showed me these. My 2 nephews however are different, they are at this age where they always love to play games on the computer and sometimes at their PSP. Last year they wanted an xbox 360 but this year I'm not sure yet. They are actually getting hooked on Farmville at Facebook as they enjoy the planting and the harvesting times. Men love their cars on top of its performance always as they love speed and precision. My brother always tries to find time to check on our vehicles and see to it that they will be working good when he drives it. Just the other weekend he is checking on the engines of our vans because we are going to use it to fetch my niece at the airport soon and we don’t want any trouble in travelling long distance. For those that have luxury or high-end cars, double care is needed to maintain it well. Some may even customize their cars to their liking, putting different mug wheels and other accessories that make their cars more superior and to stand out from the rest of the pack.. I know some men who will put or invest more money and spend more time to tinker with their cars. After all, these cars are worth showing off for they exude elegance and superiority. There are actually aftermarket auto parts that you can find online at ISG (In Sixth Gear). They offer top brands on wheels, custom car body kits, brakes, vertical doors, grills, exhausts, turbo kits and lots more. I know men would also love to have a great sound system inside their cars and ISG also offers audio and video systems for a complete car make over. Should you need total transformation or top performance and quality parts on your cars, www.insixthgear.com is the place to go. ISG’s well trained and have a know how on this industry will no doubt can assist you with all your car queries. Automotive enthusiasts will find ISG as a one-stop resource for car accessories aftermarket performance parts online. Not only that, luxury cars fanatic will find ISG the place for read the latest automotive news, view luxury car photos and lots more. Last Sunday, instead of dining out I just decided to treat my family with a sumptuous lunch at my brother's house to save. I just asked my brother to cook bbq spare ribs, chicken and fish tilapia. 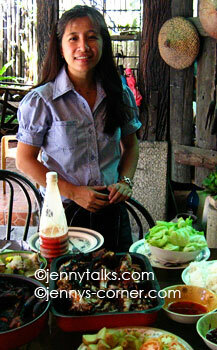 We also had pork nilaga and some salad. I guess you have read about my previous post about my sis Joy who just recently sold their house and now they are renting an apartment. They sold the house so that they can build their dream house soon and for sure it’s gonna be in 2010. I always talk to my sis Joy over at YM and they have already had a picture of what kind of house they want to be in their minds. Knowing my sis and her choice of styling their house before, there’s no chance that she will opt for clutter and too busy decorations. A clean and neat look would always be her preference and actually she is already scouring home improvements blogs or site to get new ideas for their house project. If I where in her shoes, I’ll be as giddy as her. Why not? A house that you dream all these years will finally come true. I guess not all can build a house of their own or make a brand new one so all we can do is just make home improvements or renovations, which many of you are doing or have done so. Actually we are in the process of repainting the walls in the living room to make it more appealing during the holidays. We can also be a little bit experimental and creative in our homes. Just take a look at your hallways or doorways, we always often see square corners, right? We can turn them into beautiful arched shaped corners on our own by using fabricated drywall arch. Creativecorners.net has this creative corners arches/styles that you can choose like: partial arch, full arch, eyebrow arch and step arch that you can easily d-i-y in 4 easy steps. Here's the sample of the before and after. Even your husband can do it and no need to hire professional handyman to do it for you. These fabricated arches come in a kit and easy instructions and starting from $54.95 per opening . For more info you can check out creativecorners.net. 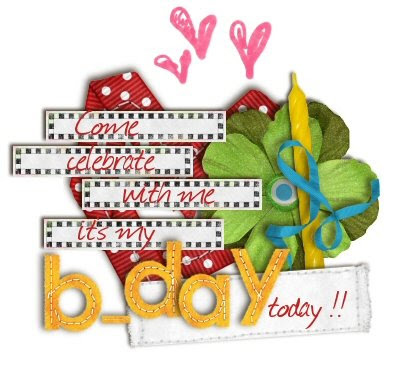 It's my special day today! I turned 42 today and I feel like I'm only 24 hehe. We just had a nice family lunch yesterday and later today my SIL will just cook spaghetti and I will just buy cakes. Nothing major celebration because I'm not that young anymore, I have passed that stage already, maybe if it's my golden year then I'll have a big bash once again. Later guys, going to the salon now for a much needed beauty treatment. Sorry no birthday contest as well like the previous years. It's Amazing Race time once again and if you are a fan just like me, here's the Results of The Amazing Race 15 Episode 9: Gary & Matt are Eliminated. The race is becoming exciting each week. Wow I can't wait who will be on top 3. Pinoys and the whole world waited for the much awaited boxing event of the year. Our very own Manny "PacMan" Pacquiao vs. Miguel Cotto of Puerto Rico at Las Vegas for the World Boxing Organization (WBO) Welterweight class. I am not really a fan of boxing but of course Manny is the one fight so we all can't help but to watch him fight on the ring. Around noon time I was already tuned online to watch the live streaming of the boxing but with thousands of fans watching on the teampilipinas.info site the video became too lag and too slow that we'rent able to see the blow by blow account. We just listened to the radio and it was so exciting. It was then finally announced that Pacman won against Cotto at 12th round via TKO the referee stopped the fight. Later on a delayed telecast was shown over at ch7 but it has too many commercials. It was an exciting fight and Cotto was so pitiful bec. his face is so bruised and battered. Hooray for Pacman! We are so proud of you! He is the best pound for pound king of the world having won 7 different titles of diff. weight division. I’m in my shopping mode lately. As you might have read on my last post I was able to buy myself some birthday gifts for myself last week and I am still itching to buy more. In fact, the other day when I went to the grocery, there’s this small booth of Lee and RRJ jeans at the entrance, I looked over at some shirts, jeans and polo blouses that they have on display because it’s 50% off and oh dear I end up buying a polo shirt that I will be using on my birthday. Aside from that my sister in law and I have been to Divisoria 2 weeks ago to buy some Christmas gifts and of course I didn’t forget myself hehe. November and December are the months that I always overspend because of my birthday and Christmas and spending is really not really avoidable. Good thing is that I have control on my spending on the 1st few quarters of the year so I have some savings. I still have birthday and Christmas material wishes and that includes a watch. I ordered a leather DKNY watch from Faye from unfortunately the style that I wanted was not available. I still want a leather watch and I’m not sure if I can get this here or just buy one when we to Hongkong this December. I don’t know about you but I really love watches but I still can’t afford those highly expensive ones. It just so happen than these days we can find some knock off watches that are replicas of the originals. You can find lots of Swiss replica watches at zenreplica.com just in case you care looking for one. These watches are made with quality and much affordable. Lately I found myself staying at home in the morning and just go to my net cafe after lunch or so. I made this decision when my online works have flourished and when I need more time to be alone in peace so I can make lots of good quality post. Everytime I'm here a my net cafe and do some opps, I find it hard to concentrate because of too much noise and disturbances. Not that I have net games but because my niece and mom watch TV with high volume that sometimes I tell them to turn the volume down. Sometimes it works but sometimes it doesn't. I am irritable when I want to concentrate but there are noises and disturbances, my mind just wants to explode. I have little patience over that. So to end my whining about not being able to work properly I usually stayed in the morning to do some works. If I have tons of works to do and my SIL is availble to stay at my net cafe then I will stay at home and she will take care of the cafe. I just paid my monthly business tax once again and it’s a never ending process as long as I have this small business of mine. Well at least I am paying my taxes unlike others who are not. How much more those that have big companies, for sure their accountants are doing a massive work for them. Sometimes getting an accountant can be a little tricky but this Las Vegas accounting firm can be a good source for all your accounting, business and financial woes. Next April is the tax season once again and hopefully you’ll have some to manage the accounting part of your business. Oh dear, it's hot and humid again today, it's even become worst after a strong rain. The weather was so erratic lately, after having experienced strong typhoons like Ondoy and Santi now we've been experiencing hot weather again even though from time to time it is raining. I think there'll be more typhoons coming till the end of the year. Now, I have to keep my aircon on all the time but I'm afraid that my electric bill will gone up. I saw this idea at Mai's blog and I thought I'd make my own list since I also have lots of stories and photos to share but since I have limited time to do so and me being lazy at times, I end up forgetting about it. Here's my list and I hope I can blog them soon. Ok now I forgot some of them already.. Yay! I have always believe that following your passion or what’s in your heart will put you ahead and will bring out the best in you. If your work requires you to do something that you didn’t like and against your will, you’ll always end up with a heavy heart and a sloppy job. I have once experienced that and I always end up nagging about the work that I am doing because I am not happy but if you love what you are doing it will not be a work anymore. I will not find it strange to see some people who are in beauty business or field. I am sure it’s their passion and their calling. Those that excel in this field are really zealous on what they are doing that is why they master their craft already. Not all are born with natural talent though that is why they are still going to a school like a beauty school to gain more knowledge and skills. Follow your passion and soar high. It's my birthday once again on Monday (16th) and like what I always do each year, I went to the mall last week on a shopping spree for my birthday gifts. Last year, I gave myself a new Canon 18-200mm lens and a new 6 Million dollar Crumpler bag as gifts. 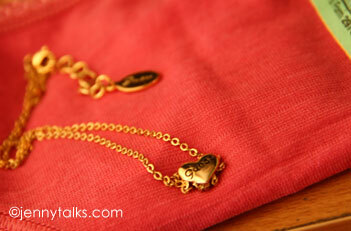 This year here are some of the things that I bought when I went to Robinson's Galleria. I bought 3 bags and a wallet 2 of which are everyday bags and the other one is a Nine West bag. I also got Lee jeans, a polo shirt and more. I just love this Nine West bag and wallet that I bought at Nine West outlet at Robinson's Galleria bec. the size is perfect and the bag is soft. 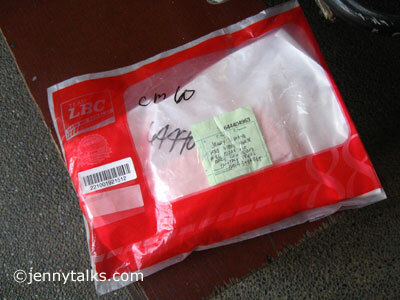 Actually I ordered a leather Coach Zoe bag from Faye but I'm having 2nd thoughts about it bec. I am guessing it was too big for me. Let's see if the bag arrives on Dec. if I will get it.